Mother’s life is pretty busy and things like manicure and pedicure are often considered a luxury. I like nail polish and often can’t resist buying new bottle. Anything related to manicure always catch my eye, so I could not skip new product called Nail Cones. These cute cones protect your skin around nails when you apply nail polish. There are different sizes to fit your fingers. You need to put a nail cone under your nail and apply tips around the nail. Then after polishing nails, remove cones. The tricky part is that cones do not need to be straight, but rounded to cover the skin around nails. 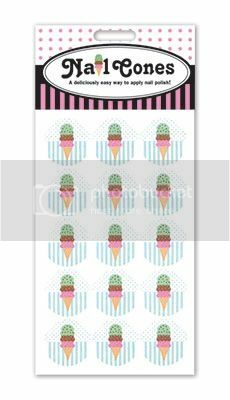 While you can find only one pattern to use I am looking forward to adding more varieties of nail cones. I am sure our little girls will be very happy to have these cones on birthday parties, girls’ gatherings or holidays like Halloween or Christmas. I like how easy you can get mess-free pretty nails using Nail Cones stickers. I know how my nieces can be so, but next time when we gather again everything is going to be different, because I take my nail cones to impress our little princesses.